The quickest payday loan might seem like the most attractive option at the time. When you are considering using a payday loan, you are undoubtedly in financial trouble. Otherwise you would not need the loan. Therefore, you might believe that the quickest loan available at the time is the best. While it might be enticing, it is not always your best option. Here are a few things to think about before you automatically take the quickest loan. Many times, the companies that give you the money the fastest will charge you the highest rate of interest. When you are dealing with payday loans, the interest is high enough already. You are going to be giving them a large chunk of your paycheck when the payment comes due. Therefore, you need to try and get the lowest rate of interest that you can instead of giving up more of your money. 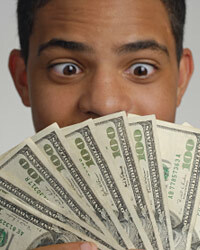 Many of the companies that offer quick payday loans are not always professional. These companies might try to pull some unscrupulous activities along the way. They might cash your check before you are ready and it can cause you a world of problems. Just make sure that you are dealing with a reputable company before you get involved.